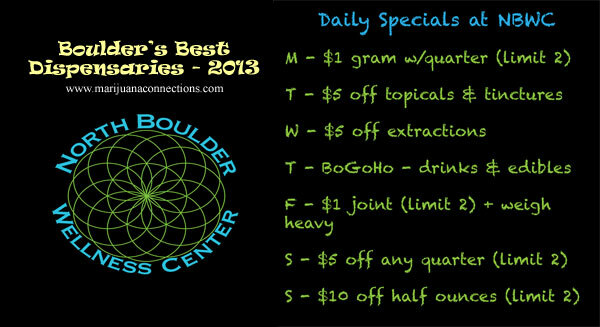 North Boulder Wellness Center (NBWC) is a medical marijuana dispensary in Boulder, Colorado. NBWC medicinal cannabis is among the best bud that can be found in Colorado. With a full menu of sativa, indica and hybrid strains, potent marijuana edibles and THC extractions, great member deals, unbeatable prices and a friendly and helpful staff, North Boulder Wellness Center is, without question, one of Boulder's best medical marijuana dispensaries. North Boulder Wellness Center is open Monday through Saturday from 11AM to 7PM and on Sunday from 11AM to 4PM.